Meet GY-HM190, the full-featured 4K Ultra HD camcorder with professional audio connectivity that’s small and light enough to take everywhere and capable of the quality you need. Its detachable handle contains two XLR audio inputs, each mic/line switchable with phantom power. And with two SDHC/SDXC slots, you can record hours of 4K/UHD (3840x2160) material or 4:2:2 HD signals at up to 50Mbps. Whether you want to fully customize your settings, or set it to Full Auto and simply concentrate on the subject, count on the compact camcorder that puts professional quality in the palm of your hand. The GY-HM190 was built to deliver stunning, life-like 4K Ultra HD (3840x2160) video. JVC’s 4K CMOS sensor with 12.4M pixels delivers high sensitivity and excellent performance over a wide range of lighting conditions. Details are crisp and accurate throughout the entire image plane. The ultra high quality imagery begins with a precision 12x F1.2–3.5 optical zoom lens (35mm equivalent: 29.6–355mm). When shooting in the HD mode, Dynamic Zoom combines optical zoom and pixel mapping from a 4K image sensor to create seamless and lossless 24x zoom. 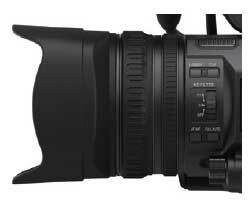 This allows the camera to have a long zoom range while retaining its compact form factor. Dynamic Zoom combines Optical Zoom plus Pixel Mapping—focusing on a smaller image area for lossless 24X Zoom. GY-HM190 comes with a wide variety of connectors to meet the needs of professional applications, including HD-SDI (3G) and HDMI. Secured digital connection is assured between external devices such as a recorder or switcher. 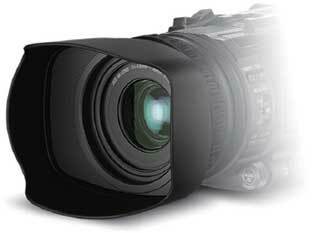 Simultaneous output from both SDI and HDMI is also possible. Working with 4K has never been easier. 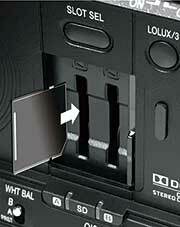 Insert an SDHC or SDXC (UHS-I Speed class 3) memory card and record hours of 4K/UHD (3840x2160) material. Recordings are made using the Quicktime (.MOV) file format and are compatible with many popular editing systems. 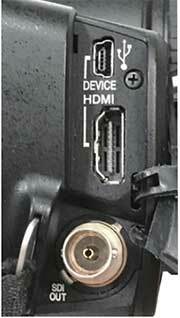 Connect a 4K/UHD monitor with a single HDMI cable, and view the camera's live 4K signal. You can also play back recorded files directly from the camera. A 70Mbps recording mode is also available to record 4K footage on economical Class 10 SDHC/SDXC memory cards. Also available is high-speed recording* at up to 120fps (59.94Hz)/ 100fps (50Hz) for smooth slow motion playback (up to 1/5 slow at 24p mode). It helps create artistic effects and lets you watch replays to examine sporting skills. The ability to record H.264 4:2:2 24-60p at 50Mbps makes the GY-HM190 an ideal camera for broadcasting and production houses alike. The color accuracy of 4:2:2 enables the GY-HM190 to deliver exceptional color resolution even when images are in sharp contrast to the background. This is particularly useful when strong colors are in contrast to bright backgrounds, or in green screen usage. Take total control of the scene with dual large rings for zoom and focus, and IRIS dial for smooth shooting. What’s more, functions you want can be allocated to 9 buttons and 4 cursor levers, so settings can be changed smoothly during recording, making professional operation really easy. The detachable heavy-duty handle makes the GY-HM190 easy to carry — and also makes it simple to shoot from low angles, thanks to its builtin REC button with lock function, and zoom lever. XLR audio inputs are provided for the attachment of a professional microphone or for LINE input, complete with Phantom power supply capability. For more advanced visual expressions, detailed image settings such as gamma and color shade can be customized. All of the customized settings are stored in the camera unit or SD card, and can be called up whenever necessary. If speed is your maximum concern, you can always go with Full Auto operation or engage Auto partially for certain functions. Reliable shooting is assured even in Auto mode. Dual SDHC/SDXC card slots make the GY-HM190 a truly versatile camcorder, offering such benefits as series recording, dual recording, and backup recording modes using reliable and cost-effective media. 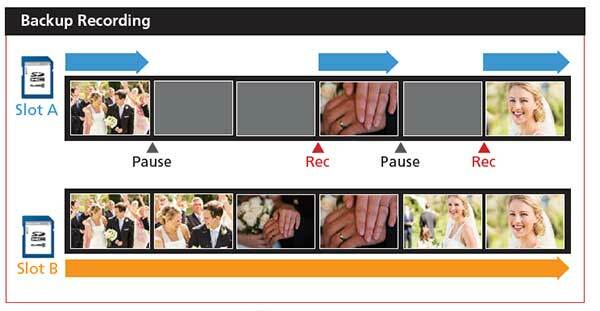 •Series (relay) recording mode: Continuous recording card by card. •Dual (simultaneous) recording mode: Recording to 2 cards at same format for backup or multi-purpose. •Backup recording mode: While the Rec trigger is used to REC and STOP recording on one card, the other card can act as a continuous backup that overrides the pause function. * This is a unique mode highly demanded by theatrical and bridal camera crews. *During simultaneous backup recording in HD mode, the duplicate file records in the same file format and bit rate as the original.